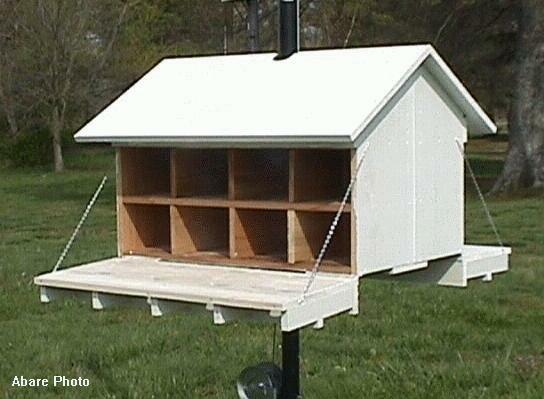 I have been asked for plans to build a Purple Martin house so many times that I lost count. Usually I sent them to a site that had the plans for a basic house along with a few corrections that needed to be made to the house so that it would be suitable for purple martins. But still, even though the house would work, I wasn't really happy with its design. So, I finally decided to sit down and draw up a set of my own. Now, these are not just another set of house plans, these plans are for a house that was designed with the safety and comfort of the purple martin in mind. 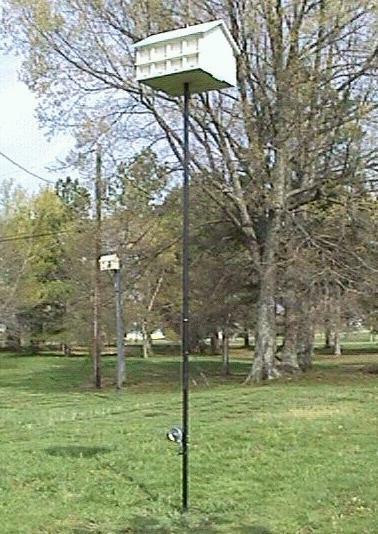 Since man was introduced to the purple martin, they've been supplying housing for them to nest and raise their young in. However, not knowing any better, most of the time, the houses were built incorrectly and many a time, the purple martin had to pay for that mistake, either with discomfort or with it's life. The compartments were often much too small for a bird that is almost 8" in length and many times, the entrance holes were incorrect, sometimes too small or just the opposite, much to big. Too small and the martins couldn't get in and too big and not only the martins, but also many pests and predators could also get in. Also, houses were often built without the ability to access the insides of the house so that it could be cleaned out and maintained. Nest checks were unknown in days past, so that feature wasn't incorporated into the design. Not knowing any better, most of the time, the house was built and then placed on top of a stationary pole and then left to the birds. Unfortunately, as of late, the two major pest bird species, the European Starling and the English House Sparrow soon took over the house and actually eliminated the nesting of martins, the very bird the house was built for. The landlord, not knowing any better, allowed them to live in the house and in so doing put any martins that might have moved in under much stress and peril. However, education about the purple martin has increased greatly in recent times and we now know much more about this beautiful bird and its habits. We've learned much more about attracting them, keeping them and what is required to keep them safe while they are in our care. Within the last 10 years, house designers have incorporated the features that will enable the landlord to tend to his martins with ease, such as performing house maintenance, evicting pest birds such as the starling and sparrow and of course, the performing of nest checks enabling him to see how well his colony is doing. Below is the house that I designed. Following are some of the features that make it a house designed with the purple martins in mind. was designed to fit around a steel pole, allowing the landlord to easily raise and lower the house. plans come with two entrance hole options, round 2" holes and the crescent shaped as shown here. has a 2" spacing in the middle of the house and with holes drilled in the back of the compartment walls, allows for good ventilation. 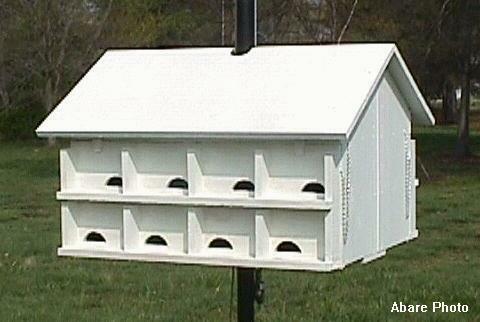 has spacious 6 1/2" W x 5 1/2" H x 9 1/4" Deep compartments allowing for large broods that can back out of the way of predators. has front doors that enable the entire front of the house to be opened, easily allowing nest removal, replacement and nest checks. actually looks like a house. plans comes complete with a pulley and safety strap for the top of the pole, along with complete building, assembling and mounting instructions. The house shown is painted all white, but if you prefer, the trim can be painted a different color and of course, the roof can be of a different color also. Although white is less heat retaining, there is a space above the nesting compartments that allows for air to flow through the house thus cooling the attic, so if you want your house roof to be of a different color, then so be it. You will be required to locate and purchase the ground socket, 1 7/8" O.D. schedule 40 (or 80) pipe, winch with cable, top pulley and mounting brackets. I'm sorry, but I no longer supply safety brackets and a pulley. The cost of materials skyrocketed and it now costs me more to have them made and shipped than the price asked and people questioned my prices. The costs of materials have risen dramatically lately, so I can no longer offer them at the price I had. I'm not in this to make a living, just want people to get purple martins. However, the plans I send give details of how to make the pulley and brackets. This will take you to a pulley that will work for this project. ...is made of cast iron for good strength. ...will take up to a 1/4" diameter cable. ...has a 2 - 3/8" thread dia (the distance required to get the cable outside of your 2" diameter pole). ...at the time of this writing the cost was around $24... (I said these things weren't cheap). As for the brackets, all the dimensions are given on my plans and, they can either be made by the individual that gets the plans, or they can be professionally manufactured as I did. Make sure they are plenty strong enough (at least 1/8" thick Aluminum) to safely handle the loads. Although the house may only weigh around 40 or 50 lbs, I used at least a 5 to 1 safety factor, so the brackets will have to be able to handle a load of at least 250 to 300 lbs. Again, safety is a concern and we don't need anything coming down at the wrong time because of weak mounting brackets. There are two ways to get the plans. Send $12.00 and I'll get it back to you.I will supply the envelope and postage. Please add a note stating you want House plans since I also offer rack plans and need to make sure which is requested. Email address (NO, I do not keep, sell or give them away. It's in case I have a problem and need to contact you). Please insure that the 'ship to' address is correct. I will supply the envelope and stamps, which will take care of the shipping and handling.